Not all is well with the ICE 4 trains that Siemens and consortium partner Bombardier are manufacturing for Deutsche Bahn. There are problems with the welding seams and as a result Deutsche Bahn will not take any more ICE 4 trains until the problem has been resolved. DB stresses, however, that there are no safety issues with the ICE 4 trains currently in service so they will remain operational. Bombardier and Siemens discovered the problems when fulfilling their quality management service. Skoda Transportation and its consortium partner Skoda Vagonka have signed a framework agreement with Czech Railways for 50 electric multiple units. The parties then signed a contract for the supply of 31 units, worth 3.6 billion Czech korunas (160 million USD / 140 million euros). The trains in question are RegioPanters. Skoda says it will deliver the first four units within 25 months. The framework agreement will run for eight years from signing. The Alstom joint venture in South Africa, Gibela, has a contract to manufacture 600 trains for the Passenger Rail Agency of South Africa (PRASA). Gibela delivered the first three X’Tropolis Mega trains between December 2018 and March 2019. Now PRASA presented the first two of these to the residents of Cape Town at an event attended by more than 1,000 guests. In November 2018 Siemens opened its Bogie Service Centre in Lincoln, UK. It has now reached the milestone of having serviced its 100th Eurostar (Velaro e320) bogie. The other train for which the service centre is providing bogie and wheelset overhaul and maintenance for is the Desiro City. Siemens, together with its Turkish consortium partner Bozankaya, holds a contract with the Bangkok Mass Transit System Public Company (BTSC) to deliver 22 four-car trains. The consortium won the contract in May 2016. The first seven of these metros have now started running on the Bangkok Skytrain (BST). French company Alstom is manufacturing the rolling stock for the CEVA rail link, which will connect Geneva, Switzerland, to Annemasse in France. Alstom will deliver these trains, which will operate under the name Léman Express, starting this summer. This follows two years of extensive testing in the Czech Republic. The CEVA rail link is scheduled to open in mid-December 2019. 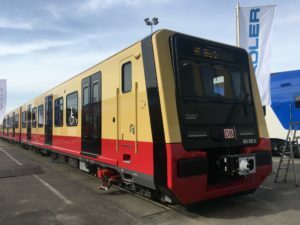 The new S-Bahn for Berlin, which manufacturer Stadler unveiled at InnoTrans 2018, is undergoing extensive testing in the world’s largest rolling stock test centre, Siemens Mobility’s Test and Validation Centre (PCW) in North-Rhine Westphalia, Germany. Following this, the S-Bahn will complete its first test runs on Berlin’s S-Bahn network. DB Cargo AG and VTG have completed their research project into innovative freight cars. They have now presented the results to the German Federal Ministry for Transport and Digital Infrastructure (BMVI). The innovative freight cars include an automobile transport car and a multi-functional flat car for steel transports (BraCoil). The transport ministries of Germany and the Netherlands have expressed their desire for the rail link between Berlin and Amsterdam to be more attractive. As the environmentally friendly option, they want both more goods and more people to travel on this route by rail. The results of a study have shown that by using multi-system locomotives and cutting out some stops, travel times can be cut by 20 minutes without the need for additional infrastructure.